010117 NOTE: Until further notice, I am on hiatus from teaching yoga. A student of yogic philosophy for over a decade, when Stephanie began the asana (physical) aspect of yoga four years ago, she said it was like the last piece of a very important puzzle had finally slipped into place. 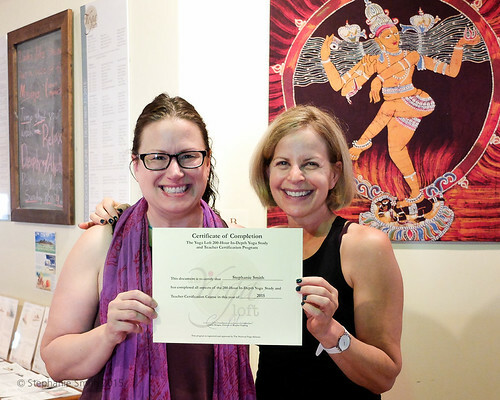 In 2015, Stephanie Smith completed the 200 hour Yoga Teacher Training at The Yoga Loft in Bethlehem, PA and is currently a Registered Yoga Teacher RYT-200 through the Yoga Alliance. Stephanie teaches Hatha yoga classes that are gentle/level 1, alignment focused and beginner friendly. Conscious breathwork, mindfulness practices, vocal toning/use of mantra, and simple lessons in yogic philosophy are commonly included. "Whether in art or yoga, my teaching style is gentle and intended to be of an empowering nature. I hold space for you and let you know that everything I offer is an option- that you always have choice. I am patient and resourceful- if something doesn't work for you, I'll do my best to find another option that will. My greatest joy as a teacher is guiding people to do things (for any number of reasons) they didn't think were possible. I like helping people quiet their inner critic and to discover that the journey is often much more important than the destination." Pricing for hourly private yoga lessons depends on location. I am also open to teaching public classes at your yoga studio, or offering private group lessons at your business. Please contact me to discuss.